How much does Open Rhinoplasty Cost? Open and closed rhinoplasty are the two major techniques to perform nose reshaping cosmetic surgery. Open rhinoplasty is the preferred technique where significant changes to the nose are involved. The cost of open rhinoplasty is one of the important aspects a patient will look at because the procedure is often elective and is not covered by medical insurance. The surgeon will discuss various aspects of open rhinoplasty, including its costs, during the initial consultation. The first goal of the surgeon will be to educate the patient and help them make a well-considered decision about open rhinoplasty. 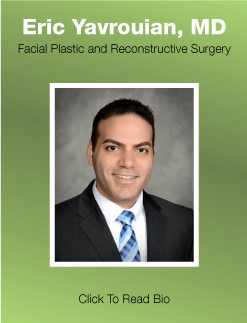 Fantastic facial plastic and reconstructive surgeon Dr. Eric Yavrouian provides this procedure to patients in Glendale, Pasadena, Burbank, Greater Los Angeles, Beverly Hills CA, and other cities and neighborhoods in this area of The Golden State. A practice located in a main metropolitan area or a prime urban center is likely to have higher costs because of expensive real estate and other overheads. On the other hand, a practice operating in a small town in an interior region may be able to offer slightly lower costs. This will apply to the average costs of most of the products and services offered in a region, including cosmetic services. The fee charged by the surgeon is an important cost component in a procedure such as open rhinoplasty. Patients should ideally select a surgeon with focused expertise and training in the area of facial procedures and head and neck surgery. Open rhinoplasty requires advanced surgical skills to achieve the desired corrections in aesthetic shape and function of the nose. A skilled surgeon will be able to produce aesthetically and functionally superior outcomes with minimal scarring. The surgeon will usually have an option to perform the rhinoplasty procedure at a hospital, an accredited surgical center or a private surgical suite. They will explain the costs and benefits associated with each option to the patient and help them make a judicious choice. If general anesthesia is involved in open rhinoplasty, it will require the services of an anesthesiologist or a nurse anesthetist who may charge a fee according to their skills and experience. In some cases, open rhinoplasty may involve complex procedures such as cartilage or bone grafting, nose implants, functional corrections, or nose reconstruction. On the other hand, some patients may only require minor aesthetic improvements such as removing a nose bump or refining the nasal tip. The sticker price can vary according to the length and complexity of the procedure. In exceptional cases, open rhinoplasty may be fully or partially covered by insurance, if the procedure involves correction of breathing issues through the nostrils. Salient and dedicated facial plastic and reconstructive surgeon Dr. Yavrouian receives patients from Glendale, Pasadena, Burbank, Greater Los Angeles, Beverly Hills CA, and other cities and communities in this part of the southwest for open rhinoplasty.